The Maryland Senate Judicial Proceedings Committee on Thursday approved a bill that would ban anti-transgender discrimination in the state. The 8-3 vote took place slightly more than two weeks after lawmakers held a hearing on Senate Bill 212 that state Sen. Rich Madaleno (D-Montgomery County) introduced last month. The measure would ban discrimination based on gender identity and expression in employment, housing, public accommodation and credit. State Sens. Brian Frosh (D-Montgomery County), Lisa Gladden (D-Baltimore City), Jennie Forehand (D-Montgomery County), Jamie Raskin (D-Montgomery County), Robert Zirkin (D-Baltimore County), Norman Stone (D-Baltimore County), C. Anthony Muse (D-Prince George’s County) and James Brochin (D-Baltimore County) voted for Senate Bill 212. State Sens. Nancy Jacobs (R-Cecil and Harford Counties), Christopher Shank (R-Washington County) and Joseph Getty (R-Baltimore and Carroll Counties) opposed it. The committee by a 7-4 vote margin also approved Raskin’s proposed amendment to SB 212 that would allow for “private and functionally equivalent” spaces, such as locker rooms, for people of different gender identities. Gender Rights Maryland Executive Director Dana Beyer, who announced late last month she will challenge Madaleno in the June Democratic primary, specifically applauded Stone, Muse and Brochin who voted against a similar measure last year. She also thanked Raskin and attorney Jonathan Shurberg for securing the necessary votes on the committee to ensure SB 212’s passage. Equality Maryland Executive Director Carrie Evans and other LGBT rights advocates also applauded the vote. 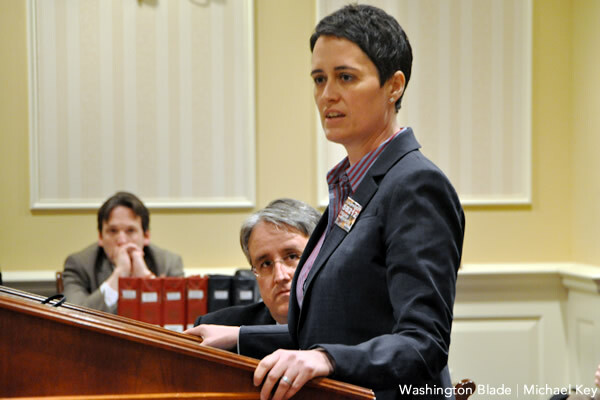 Gubernatorial candidate Heather Mizeur is among those who also testified for the measure. Her Democratic challengers – Lieutenant Gov. Anthony Brown and Attorney General Doug Gansler – submitted written testimony in support of SB 212. Elaine McDermott of Maryland Citizens for a Responsible Government and Peter Sprigg of the Family Research Council are among those who spoke against the measure. The Maryland Catholic Conference and other organizations submitted testimony in opposition to SB 212. Baltimore City and Baltimore, Montgomery and Howard Counties currently include gender identity and expression to their non-discrimination laws. Hyattsville in December became the first jurisdiction in Prince George’s County to pass a trans-inclusive anti-discrimination ordinance. Madaleno told the Blade he feels the three major Democratic gubernatorial candidates who all supported the measure helped secure its passage in the committee. He added the fact that neighboring Delaware last year added gender identity and expression to its anti-discrimination law was another factor. “It’s a number of things where we just had the momentum,” said Madaleno. Delaware is among the 17 states along with D.C. and Puerto Rico that ban discrimination based on gender identity and expression. Lawmakers in Pennsylvania, New York and other states have introduced similar measures. The Maryland House of Delegates in 2011 approved a trans rights bill. The Senate Judicial Proceedings Committee last March narrowly killed an identical measure that Madaleno introduced. SB 212 will now go before the full Senate where observers say it has enough votes to pass. The Maryland House of Delegates in 2011 approved a similar bill that did not include public accommodations. For some reason the slug for this article URL suggests the committee killed the bill. ¡Qué lastima que no está en español, no pude leerlo!